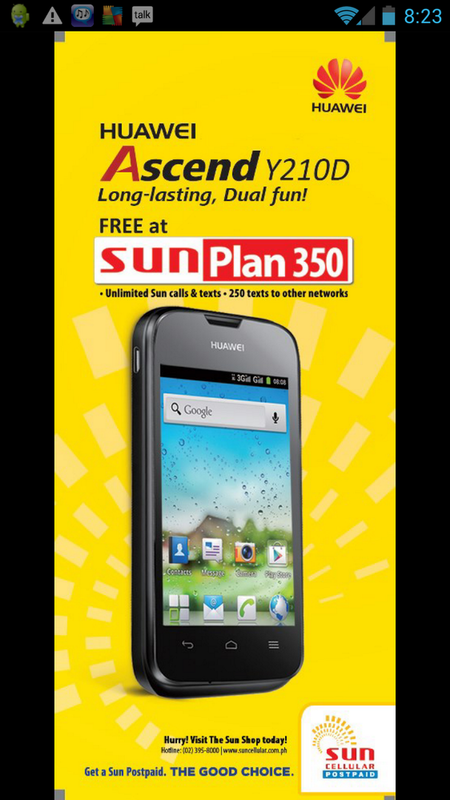 Sun Cellular is now getting more popular on postpaid because of its affordable plan offers, their latest addition on postpaid offers is the Huawei Ascend Y210D free at Sun Plan 350. Get Huawei Ascend Y210D as your first smartphone and enjoy the great features, it has 1 GHz processor, 3.5 inches screen size in HVGA (480x320) resolution, 3G capable, Wi-Fi Support, 256 RAM, 2 megapixel camera, longer battery life in 1700mAh and Dual SIm/Dual Standby feature. 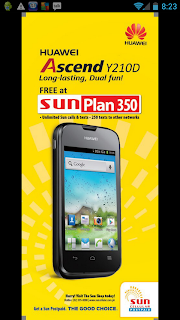 You may also inquire at your nearest Sun Shop about Sun Plan 350 profiles; they also have the options to choose from Call and Text Unlimited, Text Unlimited and Fully Consumable profile to be bundled on Sun Plan 350. To apply Sun Cellular Sun Plan 350, you can call 395-800 or visit your nearest Sun Shop to inquire before availing this postpaid plan. For list requirements on applying Sun Postpaid plan you may see here. Just comply to their terms and conditions and complete the applications requirements. You can also apply Sun Postpaid Plan online just visit here then complete the details and requirements needed to process your online application.